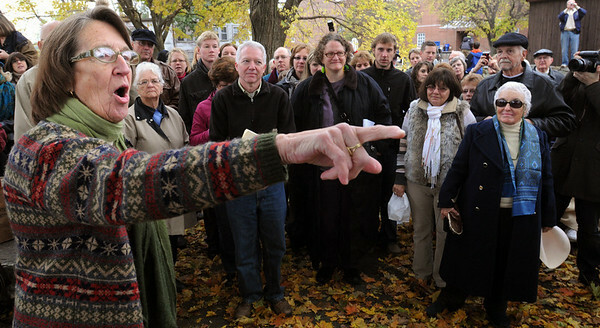 Alison D’Amario at the Salem Witch Museum, who chaired the Witch Memorial’s design competition talked about Martha Carrier and the history of the memorial as she speaks to the large crowd of descendants of Martha Carrier at the Witch Memorial. Martha Carrier was one of the women who died in the witch trials and is immortalized at the memorial site. Photo by Ken Yuszkus/Salem News, Saturday, November 6, 2010.